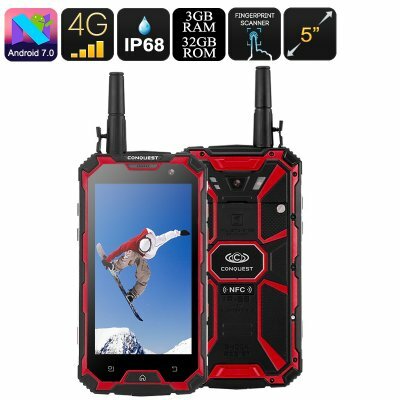 Successfully Added Conquest S8 32GB Rugged Smartphone - Android 7, 3GB RAM, Octa Core CPU, 4G, NFC, Walkie Talkie (Red) to your Shopping Cart. With the 32GB version of the Conquest S8 2017, you'll be able to stay connected for longer and in all environments. With its rugged design and IP68 rating, this powerful Android phone can accompany you on any adventure. If you work tough environments or lover exploring the outdoors this is the perfect phone to keep you company. Its well protected from dirt and water ingress, furthermore with its Gorilla Glass protected screen it is more resilient to drops and knocks. This phone has great cellular support across 2G, 3G, and 4G networks but should you find yourself off the beaten path then you'll still be able to communicate with the cool walkie-talkie function. Packing a massive 6000mAh battery this rugged smartphone can go days without needing to be recharged. Beneath that rugged exterior is a powerful Octa-Core MTK6753 processor running at 1.5Ghz. This is alongside 3GB of RAM so you have a fast and stable performance. There is 32GB of onboard storage space and with the micro SD card slot, this can easily be extended to offer 64GB of additional space. So if you love gaming or want to watch movies on the go then the Conquest S8 is able to deliver.